Arak Bali is a very high alcohol content drinks. Made from fruit distillery. Which is very much an alcoholic beverage made ​​traditionally in the Karangasem regency, Bali. And many drunk by the Balinese, as a drink to celebrate and relax. But this time Arak Bali lot can be sold in pristine condition. Arak Bali on the market, many of which have been mixed with certain fluids, to gain a huge advantage. Ordinary Arak Bali mixed with water and liquid hazardous to add thermal effects at Arak. 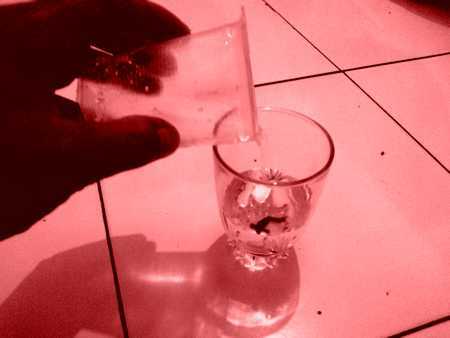 Dangerous fluids are often used to mix Arak Bali is methanol. Since it is very popular and is in demand in the market, especially in Bali, Bali Arak currently very poor quality. Most likely Arak Bali before it reaches the buyer, have been mixed before. Arak mixing with hazardous liquids, such as methanol, is very detrimental to consumers. It is very dangerous to the human body. It can even lead to physical disability, and death. Last year to this year, Arak Bali has been awarded many victims. Tourists teenagers from Australia, Liam Davies (19), died on Sunday, January 6, 2013, after poisoned by Arak. Liam Davies drink Arak when celebrating the New Year in a bar, on the island of Lombok. After drinking Arak, Mr. Davies became ill. Then he brought Australia, but died while being treated in hospital. Last year, a 18-year-old tourist, suddenly blind after drinking Arak Bali. So also in September 2011, when a native Perth rugby player, died after drinking Arak Bali mixed with methanol. Of the many cases, the Australian Health Authority warns of the risk of poisoning when drinking Arak Bali to the tourists. Australian Foreign Minister, Bob Carr, said it would make "serious representations" in Indonesia regarding beverage distribution arrangements in tourist areas.